Distance range with assistance of electric motor is 40km which depends on: battery charge level, level of assistance, weight of rider, selected road and weather conditions. Additional connection of second battery with automatic switch when the first one is empty, which prolongs travel distances. Throttle lever, has function of fluent start up without turning the crank set until the speed 6km/h is reached. After that the motor will automatically cut off the power. Throttle level has also a „boost“ function. When you can reach peak power of the motor. Two independent brake systems. Disc brake and V-brake with lock system. Quick release on wheel tubes allows fast release of wheels and makes transportation easier. 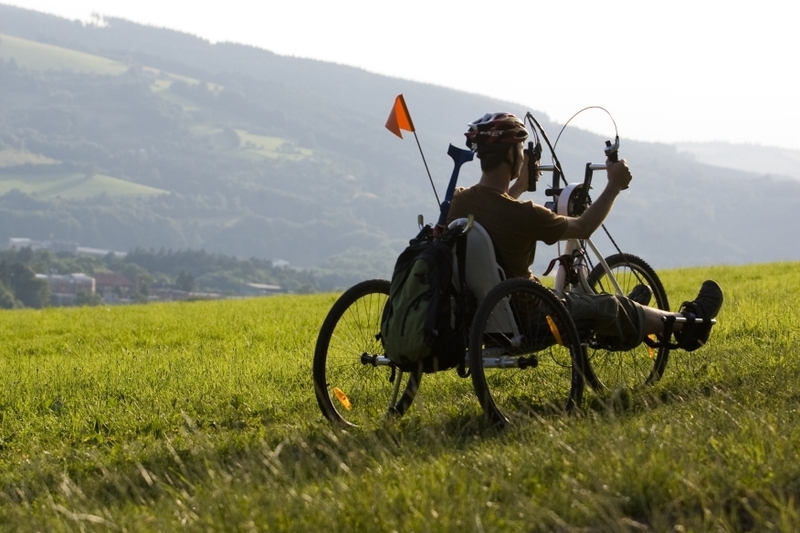 MTB patterns on tires and height of the seat allows ride the COMP handbike in terrain (biking). Position and height of seat makes easier changing between handbike – wheelchair and vice versa. Lock system on V-brake remain COMP handbike stationary when changing between handbike and wheel chair. Moving seat and back rest can be adjusting according client. Behind of the back rest is holder of the wheel chair. When crank set stops turning, electric motor power is cut off. When the battery is discharged, there is possible to use COMP handbike as regular handbike just without electric motor support. MULTICYCLE QUALITY PRODUCTS CZECH, S.R.O.